Theremini Advanced Software Editor, Other software for iPhone / iPod Touch / iPad from Moog Music. 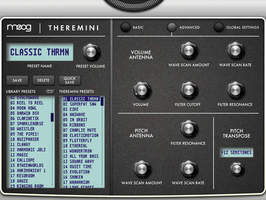 The Moog Theremini Advanced Software Editor for the iPad does not generate any sound, but connecting it to your instrument, you can create new presets, edit existing ones and even generate new sounds in real time while you play the Theremini. The app also allows you to edit the global parameters of the synth. 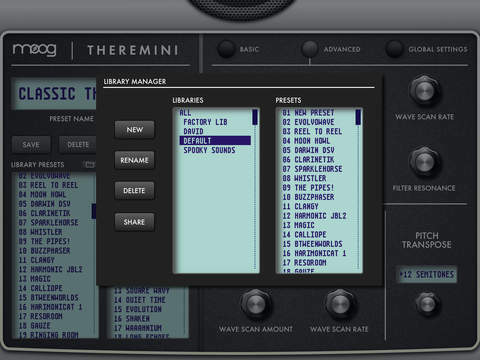 The editor offers unlimited preset storage and you can share the sounds via e-mail and iTunes. The Moog Theremini Advanced Software Editor is available for free at the AppStore, only for the iPad. Overtone DSP launches a new EQ plug-in Overtone DSP has released AF2-10, a new multiband graphic EQ plug-in available on Mac, Windows and Linux at a special price. 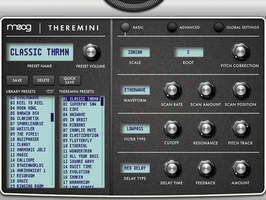 The Drop reaches its v1 Cytomic finally launched v1.0 of its The Drop filter plug-in, which has been under development for more than three years. The U-He Presswerk in public beta U-He stated last week that a public beta of its new plug-in would be available during the weekend, and it is indeed online.